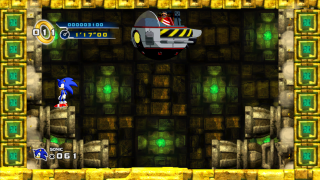 The Lost Labyrinth Zone Boss takes a page from Sonic 1's Labyrinth Zone boss, where Eggman evades Sonic up a dangerous shaft of spikes and enemies. Sonic must follow him though this path while also avoiding the rising water. The real changes to this boss happen when Sonic escapes the deadly shaft. To beat Eggman, observe where Eggman travels and memorize the patterns the pillars move to avoid getting crushed by them. Attack Eggman when possible.